FINISH: Trevor has been working on some wonderful things in his workshop recently and this is his latest creation. Ella, the bike's owner is an Australian expat and she wanted this part of her character to be represented in the scheme so we took the silhouettes of indigenous British and Australian leaves and had them cascade around the downtube. 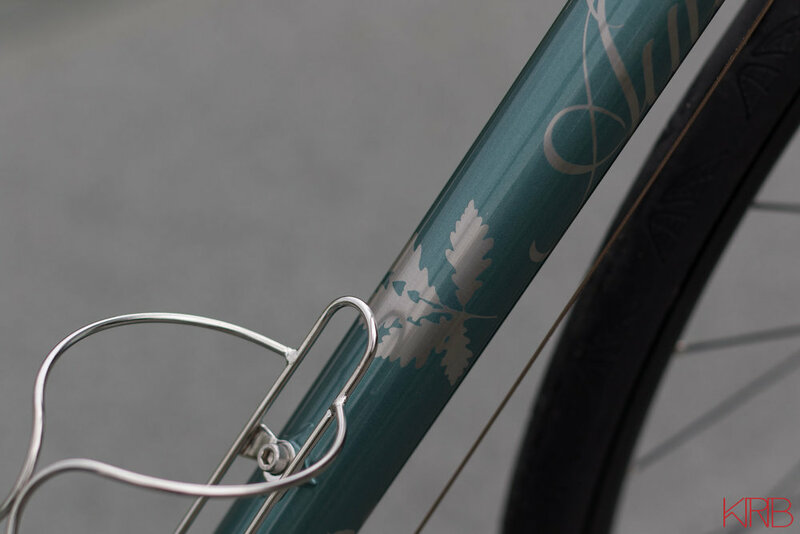 For the flourishes on the fork and stays, the same leaves were used to create a transitional pattern between the metallic green and the flat teal colour. The seattube has a fine line logo totem and the front of the bike is finished off crisply with another custom made silver headbadge from Ella Bull.